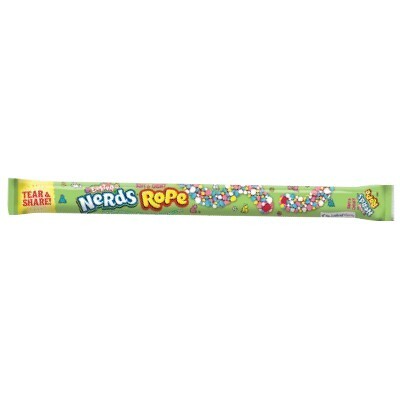 This zany concoction from Wonka is as much fun to play with as it is to eat! 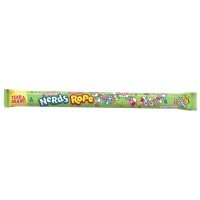 Your favorite tart and crunchy Nerds are back, this time surrounding a yummy gummy candy rope. This Easter edition features Nerds in beautiful blue, pink, and yellow Easter pastels, adding a fun and festive touch to your holiday snacking! Dextrose, sugar, corn syrup, less than 2% of: acidity regulators E296-E330, gelatin, glazing agents E904-E903, glycerin, natural flavors, color added, colors E120-E133-E132-E129*-E102*-E110*. *May have an adverse effect on activity and attention in children. Contains GMO. Nutrition facts (for 100g): calories 346Kcal, total fat 0g (saturated fat 0g), total carbohydrate 84.6g (sugar 76.9g), protein 0g, salt 0g.